How to read the crowd as a DJ: Learn this and nail every DJ set! DJ tips for beginners – 11 Top Tips Beginner DJ’s need To Know! Ready to learn how to become a DJ? This really is the ultimate guide that contains everything you will need to know from the different setups to making money from DJing. Every beginner DJ needs this guide! So you've decided to become a DJ. You've listened to some mixes, watched the DJ at the club, and you really want to give it a go; but you don't really know where to start. Go back in time twenty years and all you would have needed was a set of turntables and a mixer. But DJing has come a long way since then, turntables are still used but in a totally different way (which we'll cover later). As well as turntables we now have, CD players, controllers, and digital software. You can also incorporate separate effects units, drum machines, and a host of different hardware. Do you want to go the traditional route and set up a pair of turntables with a mixer? Do you want to keep the traditional feel but get yourself some modern CD players (CD decks)? Maybe you want to mix tracks directly from your laptop or computer using this traditional feeling set-up? How about mixing tracks directly from your laptop or even your iPad using an all in one DJ controller? Or maybe you want to go purely digital and mix on your computer, phone, iPad, etc? Obviously you'll be able to try all of these eventually, but it's best to choose just one to start with. Figuring out the basics of just one of these methods can be tricky enough when you first become a DJ. So have a think about it, which one will you choose? Check out some of the set-ups below. Then keep reading to learn all about the different methods that we've mentioned above! So you've made your mind up. You know what type of mixing you want to do, and what set-up you want. Whichever one you chose is guaranteed to bring you hours of fun as you become a DJ and progress. Let's have a look at each method before going onto the next step. For all of the set-ups we're about to cover you'll need a set of speakers or monitors. I always recommend that you use active speakers. Active speakers are powered and self amplified, meaning you won't have to buy a separate amplifier. You simply plug them into your mixer and a power source, and you're good to go. In my article DJ on a budget I recommend the awesome Pioneer DJ DM-40 for home DJing. Click here for the article. You can get some brilliant turntables like the Stanton T.62 M2. These are also recommended in my budget DJing article > HERE. Or Pioneer do the higher end PLX-1000 turntables, these will suit beginners perfectly and last many years. You can check the current price on Amazon here -> Pioneer DJ PLX-1000. The downside of this set-up is that you'll have to buy vinyl records, which can be expensive. If you already have a record collection this is great. But if not you may need an alternative to vinyl, which we'll cover shortly. This is almost the same as the traditional set-up; but instead of turntables you use CD decks. This is a fantastic setup and many modern CD decks now come with the ability to plug in a USB stick. This means you won't have to buy a ton of CDs, you simply mix tracks straight from the USB stick. This offers a much cheaper way to become a DJ while still giving you a traditional feeling set-up. Numark do the NDX500 with this option. Or the higher end Pioneer CDJ 850k will also allow USB playback. Check the prices of these on Amazon here > NDX500 and here > Pioneer CDJ 850K. If you think CD's are outdated, or maybe they just take up more space than you'd like, you could try a digital player. A player like the Pioneer XDJ-1000 MK2 will let you play the following files from USB devices with no need for a laptop -AAC/AIFF/MP3/WAV/ALAC/FLAC. You can even plug them into a laptop to use alongside software if you'd like, as in the controller section further down. These players don't play CD's which will put some people off, but this will be attractive to others. The traditional set-up with a difference! Do you still want a traditional set-up but don't want to have to buy expensive vinyl or annoying CD's? Check out the digital vinyl system (DVS). A DVS will allow you to play tracks directly from your computer, laptop, or mac using control vinyl/CD's. Control vinyl/CD are encoded and are able to send information about the vinyl/CD's position to your computer. This allows you to use just two control vinyl, or two control CD's to play any tack from your computers library. You'll need to buy software like Serato DJ Pro or Pioneers Rekordbox. You can then purchase the control vinyl/CD's with a sound card that plugs into your mixer and computer. Don't be afraid of this option as a beginner, it sounds complicated but it's really easy to set-up and really simple to use. This all works in conjunction with your turntables or CD decks, or even both. It will get you mixing instantly with no further purchase necessary. So the DVS route is a little more expensive but offers an amazing way to become a DJ. This set-up will grow with you over many years and will suit beginners all the way to professionals. Although it's a little more pricey you will save enormously over time as you won't have to buy records. Records are super expensive, you'll pay around 7-10 times more for a single record than you'd pay for the price of a download so you can see why many DJ's are now taking this route from the beginning. Others are switching over to a DVS after decades of mixing vinyl simply because it's cheaper. Another bonus is that you won't need a massive shelf of huge boxes to store your records, and if you play out you won't be lugging around heavy record bags. If you're looking for a cheaper way to become a DJ, a controller is definitely the way to go. The DJ controller is an all-in-one unit consisting of two decks and a mixer. The controller will plug into your computer and you will select tracks using DJ software. The tracks will then be mixed with a hands on approach using the controller. Some controllers will even let you mix from an iPad, iPhone, android devices, and more. I've gone through a list of the top 10 controllers in my article HERE. No matter what your budget is or what features you want, you'll find the right controller for yourself. Or you can check a bunch of top DJ controllers out in my hardware section HERE. The controller option is the cheapest way to become a DJ while still including hardware. If you want a cheaper set-up with a hands-on approach this could be for you. A slightly more expensive option is an all-in-one DJ system which doesn't need a laptop like a standard controller. These systems are fairly new to the market but make sense for mobile DJ's or people that haven't already got a laptop. They're becoming very popular with travelling and mobile DJ's because it means you'll have less equipment to carry. You may pay a little more but you won't be forking out to buy a pricey MacBook so you could save big at the end of the day. And if you don't have a laptop at your gig there's less equipment to get damaged when somebody spills their drink on your DJ table! Check out some awesome all-in-one units in my hardware section HERE. The last setup option is a computer and software, it's that simple! You could become a DJ today by simply downloading a program to your laptop! You will be able to mix music using digital DJing software; using nothing but your software's interface. There are even programs that could get you mixing today for free! My favourite free software is Mixxx and Virtual DJ. These are two of the best programs that you'll find for free. But search around and you'll find many more fantastic programs that you can purchase, we'll look at some of these later. Assuming you already have a laptop/computer/device this is the cheapest way to become a DJ. For those that don't want hardware and just fancy mixing now and again, this could be for you. This could also suit people with limited space at home, or those that travel a lot and can't take hardware with them. If you're undecided on whether to mix vinyl or digital tracks take a look at > THIS ARTICLE to get a look at the advantages of each choice. Once your set up arrives you may need help setting it all up correctly and safely, so let's help you out. Setting up the traditional 2 deck 1 mixer set-up is very simple. First plug the turntables or CD decks and your mixer in to the mains socket. But don't turn them on yet, there's a certain sequence you must follow which we'll get to later. You'll have two phono (RCA) leads and an earth (ground) wire coming from turntables. If you're using CD decks you'll also have two RCA leads. These leads will plug in to the mixer. If you have turntables plug the leads into the phono input. If you have CD decks plug them in to the line input. You may not have separate phono/line inputs. If this is the case there will be a switch to switch from phono to line. Use line for CD decks and phono for turntables. Next connect to earth wire from your turntables to the GND of the mixer. This will normally be a simple knurled nut that you can tighten up by hand. Next you can connect your active speakers to the master output of the mixer. If you have a separate amplifier connect this to the master output. And connect your passive speakers to the separate channel outputs of the amplifier. Then you can plug in your active speakers/amplifier to the mains. But don't turn it on yet, we'll get to that shortly. Setting up a controller is also very simple. Most controllers are plug and play meaning you can plug them straight into your computers USB port. The majority of controllers also have a built in sound card to allow this. So simply plug your active speakers or amplifier into the master output. If you don't have master outputs you will need an audio interface. This will plug into your computers USB port and connect to your speakers. If there is no headphone output they will plug into your laptops headphone port. For those using amplifiers simply connect it to the master output of the controller. If your controller doesn't have a built in sound card or master out sockets you will need an audio interface. Simply plug the amplifier into the outputs of the audio interface. Then connect your speakers to the separate channel outputs of the amplifier. Setting up a DVS. You will need an audio interface (soundcard) to connect your hardware to your computer. The interface must have at least 4 inputs and 4 outputs to work. First connect the two RCA leads from your left turntable/CD deck to the 1, 2 input of the interface. Then the same with the right turntable/CD deck, but connect to 3, 4..
Next connect the channel 1 line out of you mixer to the 1, 2 output of the interface. Now connect channel 2 line out on the mixer to 3, 4 of the interface. If you have ground wires on your turntables connect those the the ground connection on the interface. Next plug in the USB cable to connect the interface to your computer. When you open up your software it should recognise your sound card and sync to it. Setting up a purely digital set-up. If you are mixing with software but need to connect loudspeakers you can do this with an audio interface. Simply connect the interface to the USB port on the computer. Then connect your active speakers to the outputs of the interface. If you have an amplifier, connect this to the outputs of the interface. Then connect your speakers to the separate channels on the amplifier. If you are mixing with headphones these will plug into the computers headphone port. So the equipment is now ready to use but you need to turn it on in the correct order as mentioned earlier. All audio components can emit a power spike which can make a loud pop through your speakers. This should be avoided at all costs as it can cause serious damage your speakers. First turn on your decks. Anything else leading into the mixer like sound cards should be turned on next. Lastly turn on active speakers or amplifiers. You simply reverse the turning on procedure but you may have to wait a moment while amplifiers discharge. Amplifiers store energy so don't turn the mixer off too soon after the amplifier or active speakers or you may still hear a pop. You'll usually see the lights on the active speakers/amplifier slowly fade as they discharge. This can be a good indicator of when to turn the mixer off. Your equipment is now ready to use and it's time to play some tracks! As this is the first time your set-up is being used we need to check that the signal levels are not too high. So load up a track and hit play and get the volume set to a level right for you. You can do this by using the master volume knob on your mixer. You can also use the volume control on your active speakers/amplifier. The gains on your mixer should remain at the 12 o'clock position. While you are setting the volume be sure to keep an eye on your VU meters. These are the lights on your mixer/software that jump along to the beat of the music. It's important that you don't see any red lights. If you see reds you need to lower the master volume on the mixer. You can compensate by turning up the active speakers/amplifier. I've got a full explanation of VU meters and EQing in this article. You can also now set the headphone volume to your liking. Now all of the levels are set you can start having a play around with the decks/mixers different functions. This also applies to software and controller users. There are many settings you'll need to use, so learn what each one does and how it changes a track. Learn the basics: What is mixing? Now you understand what each function on your equipment does we can have a go at mixing. Mixing means you will blend the two tracks together whilst making it sound smooth and seamless. This is done by getting the beats of each tune playing at the same number of beats per minute (BPM). This is called beatmatching and it's the first skill you will learn as you become a DJ. 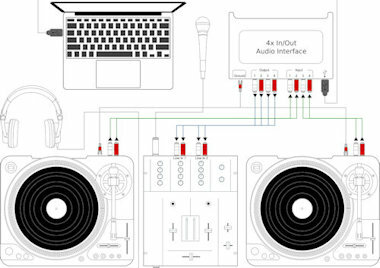 Learn exactly how a DJ mixer works and how to use one > HERE. And learn all about using DJ controllers, multi players and all-in-one units > HERE. If you're using software you'll have the option of using the sync button. Sync does the beatmatching for you and is great for time saving so you can play with effects, loops etc. Unfortunately many DJs now see the sync as the only way to beatmatch and they never learn manual beatmatching. This can cause problems if the time ever comes that you don't have a sync button. This could be whilst using different equipment in clubs for example. All DJ's need to learn manual beatmatching by ear, it's an essential skill that we all need at some point. You don't become a DJ until you master beatmatching! For a full lesson in mixing including beatmatching by ear, counting beats, EQing, and many tips and tricks see my full article - HERE. Once you have read the article you will have all of the skills needed to progress with DJ music mixing. This will take a few months to get perfected. Even if you think you have it down quicker than that you should keep practising before moving to the next step. The next step is to learn skills that will make your mixing and your sets stand out above the rest. This could be the use of loops, samples, and effects by using your software or simply an effects mixer. Or if you don't have either of these you could learn how to scratch, every audience appreciates a DJ that can scratch. 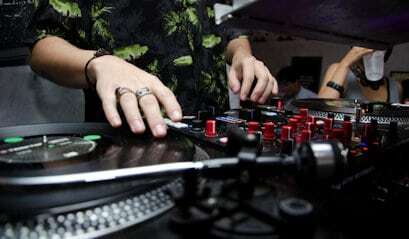 Scratching involves taking a certain sound and cutting it up with the crossfader to make different variations of the sound. This is all done in time to the beat and takes a long time to master. Some people like to scratch just to add a little something different to their sets like myself, others will become turntablists. A turtablist is a DJ that scratches, juggles beats, and basically puts on a show for the crowd using the turntable like an instrument. The chosen setup is usually a set of turntables and a DVS, but a new breed of DJ's called controllerists are now emerging. 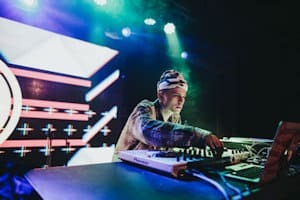 These DJ's use controllers in place of turntables, controllerism can produce impressive performance mixes that flow effortlessly from track to track while incorporating scratching and beat juggling. Great examples of turntablism can be seen at the Red Bull 3Style world championships. This style of DJing takes a lot of commitment and you can expect to spend most of your spare time practising in your room. But the outcome is so impressive that 3style champions are taking massive prizes for winning over the crowd. If scratching sounds like something you'd like to try, then take a look at my scratching article > HERE. Now you're confident in your mixing and you have some awesome skill behind the decks. At this point you'll be thinking about getting out of the bedroom to mix at a bar, club etc. When you're new to mixing choose a genre an stick to it until you have the beatmatching on lock. If you start mixing different genres together the difference in BPM and variations in the bass lines can make things more difficult. If you chose one certain genre; for example house music, the tracks will all be similar. They'll have a similar BPM, similar kick-drum, long intro/outro etc. This makes the initial learning processes much easier. Don't over complicate things, keeping everything simple when you first become a DJ is the key to progressing faster. Mixing different genres is a great way of improving your DJing skills and it broadens your options. Once you're confident in your beatmatching, general mixing, and EQing, try mixing different genres. You'll notice how much different your style of mixing will have to be for different genres. This all leads to a better more skilled DJ that can cater for any music taste a specific crowd has. If you chose a setup that requires a laptop then you'll be wondering what software you will need. There's a massive amount of software available and as we mentioned earlier some of it is even free. But you can't always just choose any old software, or the one that looks the best. Controllers will be mapped to work in conjunction with a certain program. For example many Pioneer controllers only work alongside Rekordbox, Pioneers own software, while others will only work with Serato. When you buy a controller bare this in mind, if you like the look of Serato look for the Serato symbol on the controller. If you don't see it read the specifications to see what program you'll need. Many manufacturers give you a free copy of the required software when you buy a controller so don't go rushing into purchasing software until you have a controller. Also bare in mind that some free software that's included with a controller purchase may just be a simplified version. For example Serato do Serato DJ Lite, this is simply made for learning how to mix. As you progress you'll most certainly need to upgrade to the Pro version which will cost you extra. So what choices do you have when it comes to software? We've already mentioned a few but let's look at the best of the best, and the top DJ choices. Serato is possibly the most commonly used DJ software on the market. We've already mentioned the free version that you can download right now from their website. The paid version is available as a subscription at $9.99 per month, or you can pay outright for $129. They also do a DJ suit that has all of the add-ons. Bare in mind that if you're wanting to use it for a DVS you will need the DVS add-on. Once it's on your laptop you'll be able to plug it in at the club or around your friends house and recall all of your tracks, cue points, samples, and loops. There's a huge amount of hardware that works alongside serato and even some that have been specially designed around the program. Traktor Pro 2 is the main competitor for Serato and is made by a company called native instruments. Native instruments were one of the first companies ever producing timecode vinyl back in the year 2k! Traktor Pro 2 will require a powerful laptop and comes in at $117 for the full version, or they have a full featured demo that will let you play for 30 minutes at a time. There are lots of plug and play controllers, mixers, and midi controllers, and just like Serato Trakto supports a long list of controllers by Pioneer, Denon, Allen & Heath, Reloop, Behringer, Numark, and many more. Pioneers own software which was produced in cooperation with Mixvibes who actually make their own great program. Rekordbox has become big competition for both Traktor and Serato and is a fantastic program. They do a free 30 day trial or you can buy it for $129 plus tax, you'll need to buy an add-on for $99 to use it with a DVS. Many Pioneer controllers, mixers, and players come with a free license key for Rekorbox so don't buy it until you have your hardware. Virtual DJ is another program that's been about or a long old time, it's the first software I ever used back in 2006. Thankfully it's had a few upgrades since then and the latest version really is brilliant. When you buy Virtual DJ the makers, Atomix will upgrade you for FREE every time they release a newer version which is a great selling point. I mainly see it used by mobile DJ's and beginners but that's not to say it's any less of a program, it made my top 5 list HERE for good reason. You can buy the home version for $99 or the professional club version for $299, or you can pay $19 per month. We mentioned earlier that Pioneer teamed up with Mixvibes to produce the awesome Rekordbox. Well Mixvibes also have their own software selection and Cross is the one everybody is raving about. It's available for for Pc and Mac, and DJ's who are taking the software only route will be happy to know it's also available for iOS and Android. It's compatible with a long list of controllers and can also be used as a DVS. Cross is available for $115 and the DVS which is only available for the desktop version comes as a package that includes two control vinyl for $150. All of these prices are correct at the time of writing, I will update this article regularly. Mixxx - Free full download! We mentioned Mixx earlier as being my favourite free software, and I suggest that all beginners try this program. It's a great way of getting to know DJ software before cashing out on any of the more feature packed programs. Mixxx has been developed and fine tuned by a bunch of top DJ's and producers and supports a massive list of hardware. Beginner DJ's will be more than happy with its features and it even includes free timecode vinyl control! All you will need to do is buy the control vinyl; and you'll be happy to know a bunch of readily available timecode vinyl and timecode CD's work perfectly in conjunction with it. The first step is to make some mixtapes, record your mixes and hand them out to friends and family. The feedback you'll receive is priceless and if you're going wrong anywhere this is how to find out. The best place to get your mixes heard by others is by uploading them. You could try mixcloud or make it into a video and whack it on YouTube. Once it's on YouTube find groups related to your chosen genre of music on Facebook, Reddit, and elsewhere online. Stick a link anywhere you can and the feedback will soon come rushing in. Feedback is important and will let you know if you're ready to start looking for club work. Take all feedback seriously and make sure you feel confident enough to step into a club and mix for at least an hour without making any mistakes before even contacting any venues. Promotors or club owners may ask you to prove you're worthy of playing at their venue before they risk letting you play live, so be ready for this and make sure your mixing is on point. Another thing that you can do is start building a following; Facebook pages are great fore this. You can upload mixes, do live DJ mixes, post photos of your gigs, and promote yourself. And if somebody wants to book you for a gig they can easily contact you. Another option that DJ's may consider is radio. The modern daytime radio DJ will need a plethora of skills besides mixing. But if you want a simple option internet radio is a great route. You'll have the ability to mix and present your show from home, and certain specialist stations won't require presenting skills. These stations are all about specific genres of music and people will tune in just for the mixing. You could even start your own radio show in the form of a podcast. People will be able to download the podcast and listen whenever suits them. It's a great way of getting your name out and building a following. You could promote this over a Facebook page, a YouTube channel, or a website. These are just a few examples, there are so many options available on so many different platforms. You just have to find one that works for you. If you think you're ready to become a DJ at a club, bar, or any other venue read my definitive guide > HERE. The article goes through what kit you'll be using, and ways to prepare for your first gig. You'll also learn tips that took me many years to figure out as a DJ. Many clubs will pay a fairly crappy amount for unknown DJ's, this is why it's worth building a following so that you'll be more in demand. If you can prove to club owners that booking you will attract more custom and make them more money, you can discus a higher payment. You may even want to start your own DJing business. I've done it and it's definitely worth it, it's great fun and you can make decent money too. It can cost around $3500 dollars for the initial mobile DJ setup but you'll soon get that back when you start landing gigs. If you fancy starting your own mobile DJing business read my article > HERE You'll learn exactly what equipment you need, how much to charge, and how to find gigs. Keep learning to become a better DJ! Once you've decided what route to take you'll need to learn a few more tricks. That's right DJing doesn't just mean you mix music together. Many DJ's forget that they are there to please the people that they are playing to. These people have paid good money to see them so getting it right is important. Therefore to become a DJ you also need to learn how to read a crowd. This is another important skill in DJing and shouldn't be neglected. If you don't get it right you'll be clearing dance-floors before the first tune ends. Read my full guide on how to do it right > HERE. You'll learn all about reading the crowd, the atmosphere, crowd interaction, preparing for the night, and pumping up the crowd. Once you master crowd interaction you'll almost be on the same level as a performer. You'll get the crowd pumped and they'll enjoy watching you put on a show. I actually believe some DJ's are actually performers, I'm talking about DJ's that have a big following because of their personality. People will go to see these DJ's because of who they are, not because of their mixing skills. These DJ's are usually very good at mixing, but they will put on a show behind the decks and the include many special performances in their sets. Laidback Luke is one such DJ that comes straight to my mind. These DJ's just keep getting more and more popular and gain a massive following. If you fancy that lifestyle, start with crowd interaction. You can also learn lots of tricks to make your mixing sound better. After you master beatmatching, EQing, FX, Loops, etc you can still find lots more to add to your sets. One advanced skill you can try is mixing your tracks 'in key'. This means you will find the musical key that each of your tracks is recorded in and only mix into tracks with the identical key. This makes your mixes flow seamlessly and people will find it difficult to hear the point where you're mixing out of a track. Mixing in key is more useful for certain types of music, like trance for example; when you want the music to flow smoothly. At one time finding the key would be done by ear and DJ's would mark each record, but modern equipment is making it much easier to accomplish. Now you can use programs like mixed in key, and some of the DJ software listed earlier also has this feature. Start playing with different techniques and keep learning new skills to really make your sets stand out. Learn one thing at a time and eventually all of your skills will come together to produce a unique sound that people will love. DJing is a huge learning experience and I can honestly saying that after DJing for 11 years I'm still learning new tricks. Whether it's using different equipment or learning new scratches.. Learning new software tricks, or crowd interaction, it all leads to bigger and better things. Once you've mastered the skill of DJing another thing that you may like to try is producing your own music. You'll be able to drop your own tracks and people will get to know you for your music rather than your mixing abilities. Many people will even start off by producing before they become a DJ, they start mixing their own tracks together to show off their work and wind up getting huge gigs. DJ's that don't produce will have a harder time finding gigs and getting attention so it's definitely a route worth pursuing. The last thing to mention is safety, it sounds boring but you need to take this one precaution if you want to enjoy DJing for many years to come. Have you guessed what it is yet? Most of you probably haven't because most DJ's totally ignore this - Mix safely be protecting your hearing! When you're DJing at home you'll be using low volumes that shouldn't cause you any problems, but when you start gigging in super loud venues the problems could start. When I started gigging I didn't take precautions and I would have numb ears for most of the following day, this isn't good! What you'll need is an ear plug that has been specially developed for DJ's, these ear plugs let sound through, but filter the damaging frequencies. They take a little while to get used to but anything is better than a lifetime with tinnitus! I've been using DownBeats earplugs for years and never get any numbness or ringing in my ears after gigs anymore. They're cheap, reusable, and even come with an aluminium case that you can clip to your gig bag or your keys so that you can keep them safe clean. They fit snugly under your headphones and once they're in they stay put, unlike some others that I've tried that keep falling out. Check them out on Amazon > HERE and scroll down to see hundreds of top reviews! When you become a DJ you begin creating a world of possibilities for yourself. I hope you achieve exactly what you want from this amazing hobby, career, lifestyle, whatever you want to call it. Are you ready to become a DJ but feeling held back by your budget? Find out how to get everything you need no matter what your budget > HERE. You should also check out my DJ equipment buyers guide for beginners > HERE. Or my full guide to what gear you'll need > HERE. And for some top tips check out THIS ARTICLE. Learn all about setting cue points and hot cues > HERE. Have fun learning to become a DJ! Pingback: Pioneer DJM-250 MK2 Mixer Review - Pioneers best value mixer ever? Pingback: Numark Mixtrack Pro 3 Review - The best DJ controller in its price range? It was so nice to hear about mixing and how it is a method of blending two tracks together and making them sound smooth. That is something that I really want to try out as it seems so different and yet so amazing. But since I would not know how to do it myself, I think I will enroll myself in a DJ school and learn the basics. Thanks. Hello please keep uus up to dte like this. Thanks for sharing!!! 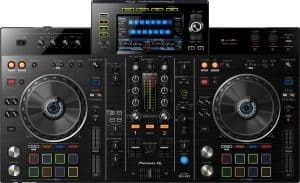 Check out the awesome stand alone Pioneer XDJ-RX2 on Amazon here! 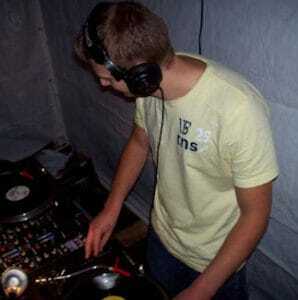 I’ve been a full time DJ since 2006, playing all styles of hard dance music. I started this website to share everything I’ve learned from DJing over the years. You’ll find tips, tricks, and helpful advice on DJ gear!